I don’t remember where I first heard about Breads From Anna bread mixes…but I discovered it one day at work. I remember messaging my friend, Jenn, on Twitter because the store locator showed that her local natural foods store, The Raisin Rack, carried these mixes. She said that the next time she made it over there, she’d check. Well, it just so happened that the next time she was over there…I happened to be with her. And my roommate happened to be in a generous mood as far as the food budget, because she handed me a basket and told me to fill it up! I did. And, lo and behold, in one of the aisles with a bunch of gluten-free baking mixes…I found Breads From Anna bread mixes. Lots and lots of them. The hard part was finally choosing which one to try first. While I love pumpkin bread…in the end I went with the Gluten Free Banana Bread Mix. Normally I make my own bread, but I have never, ever had a gluten-free banana bread come out right. I figured it was time to call in some help in the form of a mix. When in doubt…try the experts. How did I know that Anna would be an expert? I didn’t. But I had heard things. Good things. And as a celiac and type 1 diabetic, she wanted to make bread that tastes like bread (not cardboard), and as a trained chef, she was able to put her skills to the test and created safe, allergen-free products that would have superb flavor, texture, and taste. When her non-celiac brother first tried her bread…he said it tasted like bread. That was all she needed. Breads From Anna grew from there. Regardless of what I heard and the creator’s promise on the side of the box…with me…it just has to be baked and tested. Making the batter was easy. After preheating the oven and greasing one bread loaf pan, I mixed together the eggs, the oil, and the 3 bananas, which I had pureed in the food processor. In went the bread mix, and once that was well blended, I went ahead and folded in the optional chopped nuts. Because banana bread plays nicely with nuts. Into the loaf pan and then into the oven for one hour. Yes. One hour. One hour of sheer torture because after about 20 minutes, you get that amazing banana bread smell wafting out of the kitchen. I was literally doing my hand weight routine and trying really heard not to drool. The aroma was beyond enticing. I peaked into the oven about halfway through and the loaf had risen and puffed up gorgeously and was turning this fantastic golden color. I wasn’t sure it needed the remaining 30 minutes, but kept it in the oven regardless…hoping for the best this time around. When the timer went off, I pulled it from the oven and set it on a cooling rack to now cool in the pan for an hour. But…well worth the wait. After an hour…to the exact moment, I made my way back into the kitchen, grabbed a knife, and you better believe I carved a slice out of it. My roommate, who is non-celiac and a bread connoisseur, was my ultimate test. I handed her a slice of the still warm gluten-free banana bread and waited for her to take a bite. She absolutely loved it. My turn. Moist. Light. Definitely delivering on the flavor, the texture, and the overall feel of banana bread. This bread isn’t heavy and dense. It isn’t overly banana. It’s moist, but without being wet. It’s perfection. Honest to goodness bread goodness. I wish I could claim I made this from scratch. This loaf of bread puffed up to this gorgeous loaf with a nice golden outer crust. Inside, you get this fantastic banana and walnut flavor. And this loaf does bake up big. Like…better than any other bread I have made, whether from scratch or from a mix. Never before has it turned out like this one did. I’m hooked. I want to buy all the Breads From Anna Mixes and just get into that kitchen and test them all out. So, down to the science of things. The Breads From Anna Gluten Free Banana Bread Mix is made from powdered honey, tapioca starch, arrowroot, millet four, potato starch, chia flour, chickpea flour, pinto bean flour, navy bean flour, cream of tartar, baking soda, xanthan gum, and sea salt. This bread mix is gluten-free, yeast-free, corn-free, dairy-free, soy-free, nut-free and rice-free. For a bread that is yeast free…it sure did rise up beautifully. This mix is also kosher parve and non-GMO. 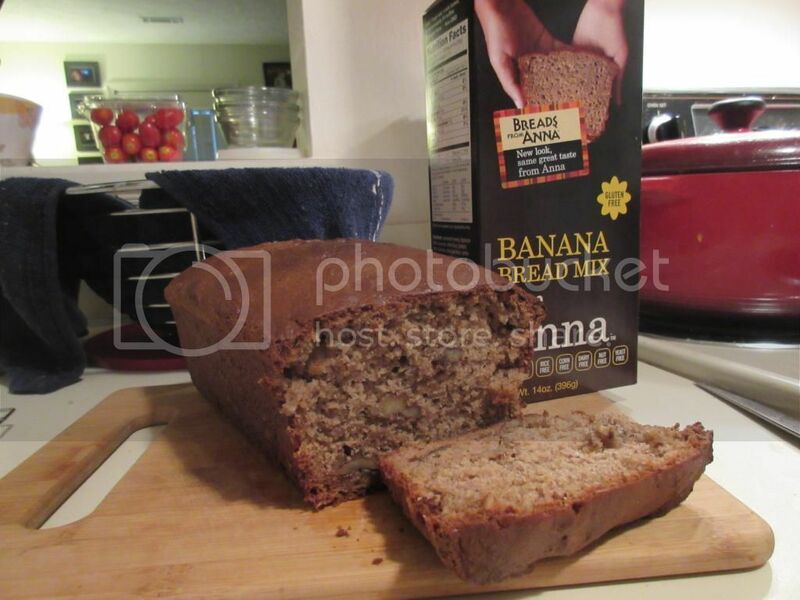 Nutritionally speaking, the Breads From Anna Gluten Free Banana Bread Mix contains 14 servings. One serving of the mix on its own is 80 calories. The mix is fat free and cholesterol free. Just the dry ingredients alone, you will be taking in 270 mg sodium and 9 grams of sugar. In addition, you will be consuming 2 grams of fiber and 1 gram of protein. With a bread mix. Thank you, Anna Sobaski…for creating this fantastic mix to make gluten-free baking, which is an art and science all itself, easy for someone like me. This bread is one of the best I have ever cooked up in my kitchen. I am happily, happily noshing away on this delicious loaf. And with all the flavor, texture and taste of “real” banana bread…no one would have a clue that they were eating gluten-free. This entry was posted in Baked Goods, Bread, Breakfast, Eggs, Flour, Food, Fruit, Gluten-Free, Mix, Nuts, Products, Review, Snacks, Sweet Stuff, Vegetarian by The Celiathlete. Bookmark the permalink.